William Penn Baker was born January 14, 1839, on a farm south of the Village of Yellow Springs, Miami Twp., Greene Co., OH, and died July 1, 1907, in the Village of Yellow Springs, Miami Twp., Greene Co., OH, at age 67. Buried in Glen Forest Cemetery, Yellow Springs, Greene Co., OH. He is the son of Isaac Baker of Chester Co., PA, and Eliza Graham of Yellow Springs, Greene Co., OH. 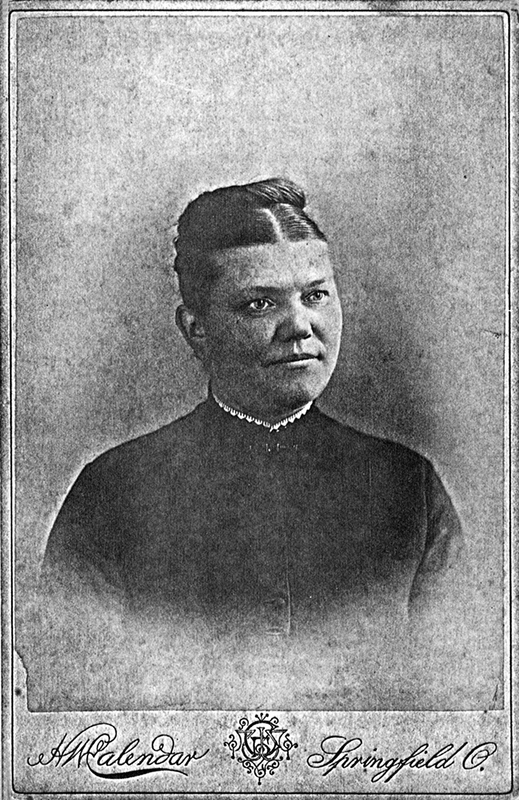 Helen Margaret "Marie" Gebauer was born October 7, 1845, in Kreis, Ohlau, Silesia (Slazen), Prussia, Germany, and died July 31, 1925, in Watertown, Jefferson Co., WI, at age 79. Buried in Glen Forest Cemetery, Yellow Springs, Greene Co., OH. She is the daughter of Albert Gebauer of Silesia (Slazen), Prussia, and Dorothea Wiehle of Silesia (Slazen), Prussia. William Penn Baker and Helen Margaret "Marie" Gebauer were married May 20, 1874, in the Village of Yellow Springs, Miami Twp., Greene Co., OH. William Gebauer "Willie" Baker: Born May 24, 1875, in the Village of Yellow Springs, Miami Twp., Greene Co., OH; Died June 11, 1876, in the Village of Yellow Springs, Miami Twp., Greene Co., OH (age 1). Buried in Glen Forest Cemetery, Yellow Springs, Greene Co., OH. Albert Means Baker: Born December 2, 1877, in the Village of Yellow Springs, Miami Twp., Greene Co., OH; Died October 29, 1956, in Belle Plaine, Benton Co., IA (age 78). Buried in Oak Hill Cemetery, Belle Plaine, Benton Co., IA. Married June 13, 1910, in Tucson, Pima Co., Arizona Territory, to Katharina "Katharine" (Dolak) Wansor: Born August 16, 1879, in Austria (Bohemia); Died June 29, 1963, at Leewood Nursing Home, Annandale, Fairfax Co., VA (age 83). Buried in Oak Hill Cemetery, Belle Plaine, Benton Co., IA. Gertrude Pearl Patricia Baker: Born February 10, 1880, in the Village of Yellow Springs, Miami Twp., Greene Co., OH; Died October 21, 1968, at St. Joseph's Home for the Aged, Watertown, Jefferson Co., WI (age 88). Buried in Oak Hill Cemetery, City of Watertown, Jefferson Co., WI. Married (1) April 29, 1897, in Covington, Kenton Co., KY, to George Hutton Anderson: Born May 29, 1876, in the Village of Morrow, Salem Twp., Warren Co., OH; Died January 3, 1932, in the Village of Morrow, Salem Twp., Warren Co., OH (age 55). Married (2) June 8, 1911, in the Village of Yellow Springs, Miami Twp., Greene Co., OH, to LeRoy McVey Bickett: Born May 1, 1883, in Xenia, Xenia Twp., Greene Co., OH; Died May 4, 1958, in Watertown, Jefferson Co., WI (age 75). Ralph W. Baker: Born March 5, 1885, in the Village of Yellow Springs, Miami Twp., Greene Co., OH; Died June 13, 1888, in the Village of Yellow Springs, Miami Twp., Greene Co., OH (age 3). Buried in Glen Forest Cemetery, Yellow Springs, Greene Co., OH. 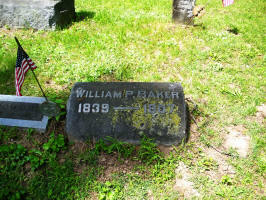 William Penn Baker is buried in Glen Forest Cemetery, Yellow Springs, Greene Co., OH. Photo courtesy of Yellow Springs Historical Society. Helen Margaret "Marie" (Gebauer) Baker. William Penn Baker was born January 14, 1839, on a farm south of the Village of Yellow Springs, Miami Twp., Greene Co., OH. 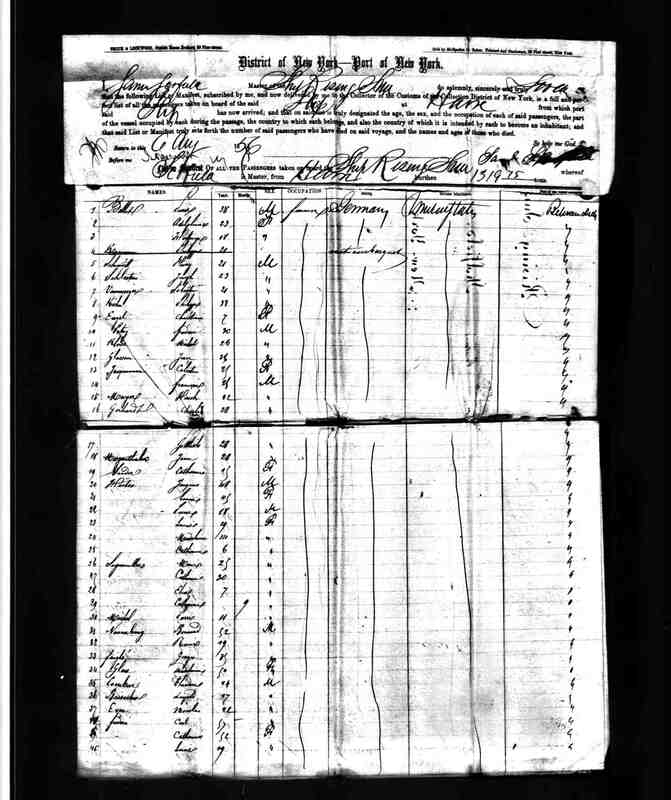 The 1840 U. S. Census shows Isaac Baker (age 30-39) is Head of Household and is living in Miami Twp., Greene Co., OH. There are also 2 males under age 5; 1 male age 5-9; 1 female age 30-39; and 1 female age 5-9. Polly Grahm is the next farm Head of Household. Helen Margaret Gebauer was born October 7, 1845, in Kreis, Ohlau, Silesia (Slazen), Prussia, Germany. The 1850 U. S. Census taken on July 27, 1850, shows Isaac Baker (age 43) born in Pennsylvania with Real Estate of $1,500 is a Farmer and is living in Miami Twp., Greene Co., OH. Living with him is Eliza Baker (age 41) born in Ohio. Also living there are seven children, all born in Ohio: George Baker (age 18), a Farmer; Louisa L. Baker (age 16); John H. Baker (age 13); William Baker (age 11); Brinton Baker (age 8); Joseph Baker (age 6); and Hesther Baker (age 9/12). On August 6, 1856, Gottlieb Gerhardt, of German Nationality (age 28) immigrated to the United States. Gottlieb and Charles Gerhardt (both of German Nationality, age 28) departed first from Germany, and then from Le Havre, France, and arrived at the Port of New York on August 6, 1856, aboard the S. S. Rising Sun. The 1860 U. S. Census taken on June 8, 1860, shows Isaac Baker (age 52) born in Pennsylvania with real estate of $2,550 and personal estate of $400 is a Farmer living in Miami Twp., Greene Co., OH. Living with him is Eliza Baker (age 51) born in Ohio. Also there are five children, all born in Ohio: George Baker (age 28) with real estate of $500, a Blacksmith; Joseph Baker (age 17); Hester Baker (age 10); Sarah Baker (age 8); and Charles Baker (age 4). The 1860 U. S. Census taken on July 8, 1870, shows Brinton Baker (age 18) born in Ohio is living in Miami Twp., Greene Co., OH. He is living in the household of a Farmer and his wife, Wm. and Mary Jeane Caufer. The 1860 U. S. Census taken on August 1, 1860, shows Gotleib Gerhart (age 34) born in Prussia with personal estate of $300 is a Furnace Laborer and is living in Vernon Twp., Scioto Co., OH. Living with him are the following, all born in Prussia: Dorothea Gerhart (age 41); Helen Gabauer (age 15); and Anna Gabauer (age 12). William Penn Baker (age 22) enlisted for a period of three years on September 5, 1861, as a Private in Co. D, 44th Ohio Infantry, and mustered out on January 4, 1864. He was then transferred as a veteran to Co. M, 8th Ohio Volunteer Cavalry. He was take prisoner and held at Libby Prison, near Richmond, VA.
William Penn Baker, after his release from prison, prepared a diary of his Civil War experiences. Click on the picture for the PDF pages. 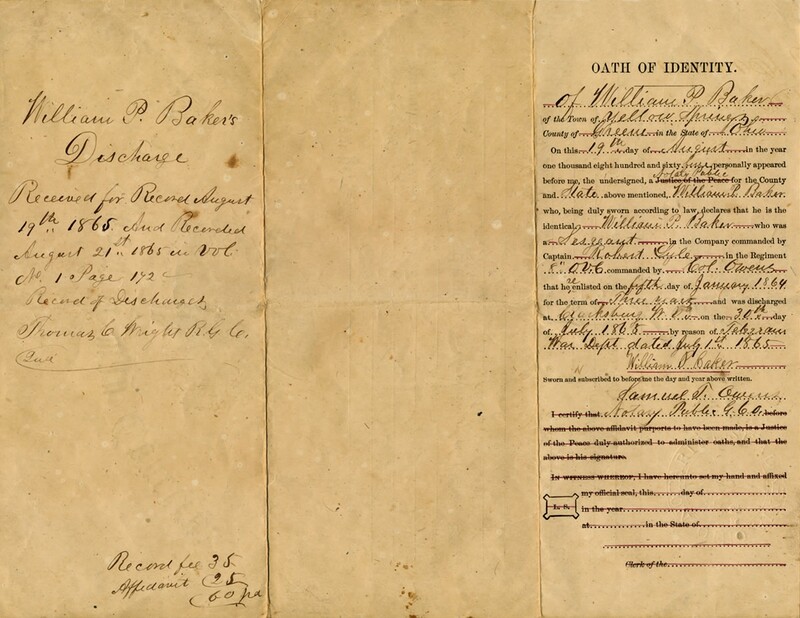 William Penn Baker Civil War Military Discharge Papers. Organized in October, 1861, under Colonel Samuel A. Gilbert, it moved into West Virginia and operated until September, 1862 - having frequent engagements with the enemy - when it moved to Kentucky. In December the men were mounted as cavalry and operated against John Morgan. It joined Burnside's advance into East Tennessee, and in January, 1864, the Regiment re-enlisted as veterans providing it should be mounted as cavalry. When it again assembled, after a furlough home, it was designated as the 8th Ohio Cavalry; in the sketch of which organization, its further history will be found. 44th Regiment Infantry. Organized at Springfield, Ohio, September 12 to October 14, 1861. Ordered to Camp Piatt, W. Va., October 14. Attached to Benham's Brigade, District of the Kanawha, West Virginia, October, 1861. 1st Brigade, District of the Kanawha, West Virginia, to March, 1862. 3rd Brigade, Kanawha Division, West Virginia, to September, 1862. 2nd Brigade, 2nd Division, Army of Kentucky, Dept. of the Ohio, to January, 1863. 1st Brigade, District of Central Kentucky, Dept. of the Ohio, to June, 1863. 2nd Brigade, 1st Division, 23rd Army Corps, Dept. of the Ohio, to July, 1863. 2nd Brigade, 4th Division, 23rd Army Corps, to August, 1863. 1st Brigade, 3rd Division, 23rd Army Corps, to January, 1864. This Regiment was organized March 28, 1864, from the veterans and recruits of the 44th Ohio Infantry, under Colonel Samuel A. Gilbert, for three years service. Colonels Alpheus S. Moore and Wesley Owens afterwards commanded. The Regiment proceeded to West Virginia, and in June joined Averill's raid on Lynchburg, skirmishing with the enemy in the advance and on the return. At Liberty it lost 71 men. At Beverly in October it was surrounded by the enemy, but drove the Rebels off in a hand to hand fight. In the meantime a detachment of the Regiment, under Colonel Moore, served in the Shenandoah Valley, fighting at Winchester, Fisher's Hill and Cedar Creek. On the 11th of January, 1865, the camp of the Regiment was suprised and over 500 officers and men were captured. They were marched through snow, barefooted, and with scarcely any food, to Staunton, where they were loaded on stock cars and sent to Libby Prison. The sufferings of the men were dreadful at the hands of a cruel and relentless foe. They were exchanged in February, and in August, 1865, the Regiment was mustered out of service. 8th Regiment Cavalry. Organized from 44th Ohio Infantry January 4, 1864. Regiment organizing at Camp Dennison, Ohio, January to May, 1864. 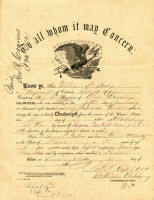 Six Companies moved to Charleston, W. Va., April 26 and balance of Regiment to same place May 8, 1864. Attached to 1st Brigade, 2nd Cavalry Division, Army of West Virginia (a detachment at Beverly, W. Va., July to December, 1864), to December, 1864. Reserve Division, West Virginia, Beverly and Clarksburg, W. Va., to April, 1865. 1st Brigade, 1st Division, West Virginia, to July, 1865. SERVICE.--March to Lewisburg May 29. Hunter's Raid to Lynchburg May 29-July 1, 1864. Action at Lexington June 11. Buchanan June 13. New London June 16. Diamond Hill June 17. Lynchburg June 17-18. Retreat to White Sulphur Springs June 18-25. Liberty June 19. Buford's Gap June 20. About Salem June 21. Moved from White Sulphur Springs to Beverly, W. Va., and duty there till January, 1865. Action near Huttonsville August 5, 1864. Action near Moorefield August 7, 1864. Moorefield and Huttonsville August 24 (Cos. "A," "C," "H" and "K" captured). Action at Beverly October 29. A detachment participated in actions at Stephenson's Depot or Newtown July 22, 1864. Battle of Winchester, Kernstown, July 24. Martinsburg July 25. Hagerstown, Md., July 29. Hancock, Md., July 31. McConnelsburg, Pa., July 31. Williamsport August 26. Martinsburg, W. Va., August 31. Bunker Hill September 2-3. Darkesville September 10. Bunker Hill September 13. Near Berryville September 14. Near Martinsburg September 18. Battle of Opequan, Winchester, September 19. Fisher's Hill September 22. Mt. Jackson September 23-24. Forest Hill or Timberville September 24. Port Republic September 28. North Shenandoah October 6. Luray Valley October 7. Battle of Cedar Creek October 19. Dry Run October 20. Milford October 25-26. Ninevah November 12. Rude's Hill near Mt. Jackson November 22. Detachment rejoined Regiment at Beverly, W. Va., December 1, 1864. Action at Beverly January 11, 1865. Mostly captured January 11. Paroled February 15 and mustered out as prisoners of war June, 1865, except the four Mounted Companies which were stationed at Clarksburg, W. Va., till July. Scout to Carrick's Ford March 14-16. Expedition through Pocohontas and Pendleton Counties June 1-13. Mustered out July 30, 1865. Regiment lost during its service (both as 44th Ohio Infantry and 8th Ohio Cavalry) 3 Officers and 53 Enlisted men killed and mortally wounded and 1 Officer and 113 Enlisted men by disease. Total 210. Gottlieb Gerhardt and Doretha Weiler were married about 1863 in Lawrence Co., OH. Gottleib Gerhardt of Germany was naturalized about March 12, 1868. * Ezra E. Adams filed first account as Guardian of S. J. Argo's heirs. * Gottleib Gerhardt of Germany was naturalized. * C. M. Golden and Arvilla Spicer, filed first account as administrators of Wm. H. Spicer, deceased. The 1870 U. S. Census taken on July 8, 1870, shows William P. Baker (age 30) born in Ohio with real estate of $500 is an unmarried Painter and is living in the Village of Yellow Springs, Miami Twp., Greene Co., OH. He is living in the household of a Retired Merchant, Nathaniel Benedict. The 1870 U. S. Census taken on August 5, 1870, shows Isaac Baker (age 62) born in Pennsylvania with real estate of $7,000 and personal estate of $870 is a Farmer and is living in Miami Twp., Greene Co., OH. Living with him is Eliza Baker (age 61) born in Ohio, who is Keeping House. Also there are three children, all born in Ohio: Joseph Baker (age 26), a Journeyman Plasterer; Esther Baker (age 20), who is Helping Mother; and Charles Baker (age 15), who Works on the Farm. 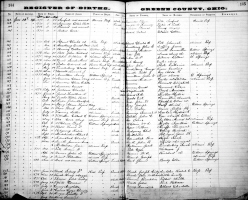 The 1870 U. S. Census taken on June 23, 1870, shows Gottlieb Garhart (age 44) born in Silesia (Slazen), Prussia, and with real estate of $2,500 and personal estate of $400 is a Farmer, and is living in Elizabeth Twp., Lawrence Co., OH. Living with him are: Dora Garhart (age 31) born in Silesia (Slazen), Prussia, who Keeps Up House; Helen Garhart (age 24) born in Silesia (Slazen), Prussia; Anna Garhart (age 21) born in Silesia (Slazen), Prussia; Rasa Garhart (age 9) born in Silesia (Slazen), Prussia; and Charles Garhart (age 6) born in Ohio. 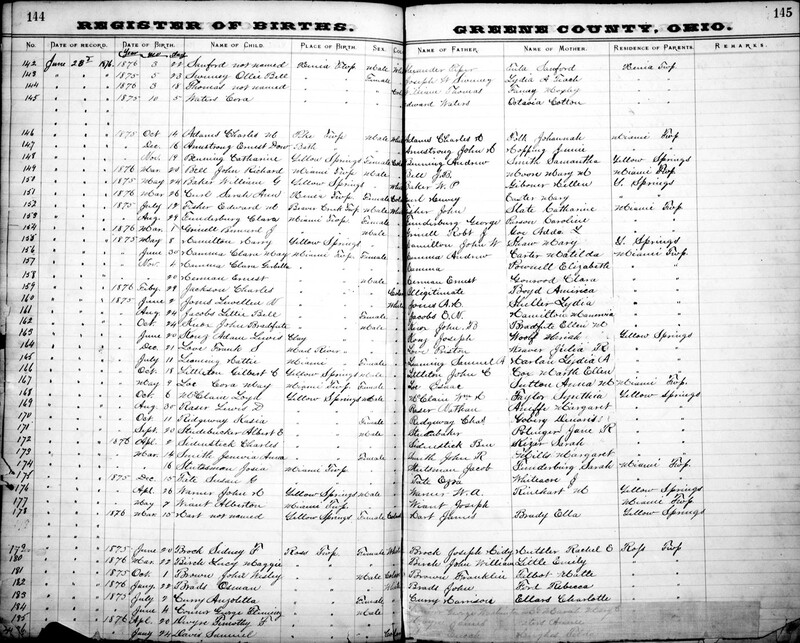 The 1870 U. S. Census taken on August 5, 1870, shows George Baker (age 38) born in Ohio with personal estate of $580 is a Farmer and is living in Miami Twp., Greene Co., OH. Living with him is Eliza Baker (age 30) born in Ireland, who is Keeping House. Also there are three children, all born in Ohio: Mary Baker (age 3); William Baker (age 2); and Elizabeth Baker (age 2). Mary Scarlett (age 12) born in Ireland, also lives in the household. 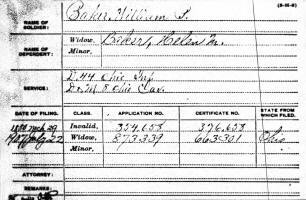 William G. "Willie" Baker was born May 24, 1875, in the Village of Yellow Springs, Miami Twp., Greene Co., OH. 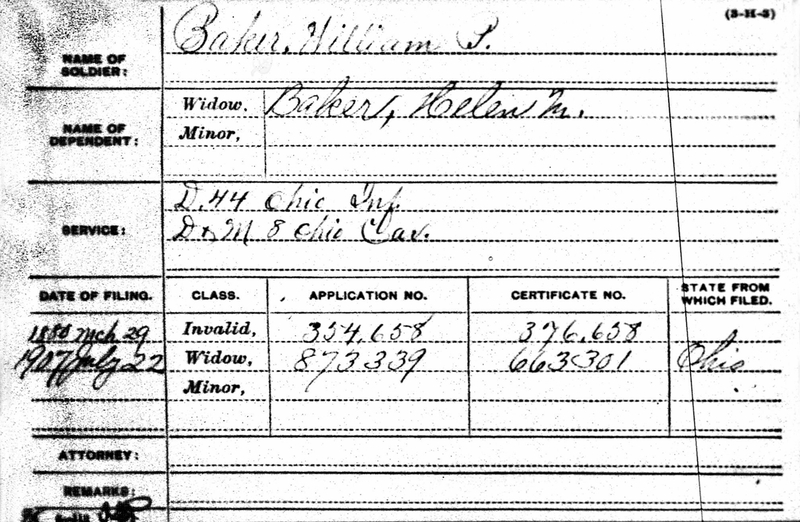 William G. "Willie" Baker Birth Record. William Gebauer "Willie" Baker died June 11, 1876, in the Village of Yellow Springs, Miami Twp., Greene Co., OH, at age 1. Albert Means Baker was born December 2, 1877, in the Village of Yellow Springs, Miami Twp., Greene Co., OH. Albert Means Baker Birth Record. Gotlieb Gerhardt died about 1878 in Elizabeth Twp., Lawrence Co., OH, at about age 53. 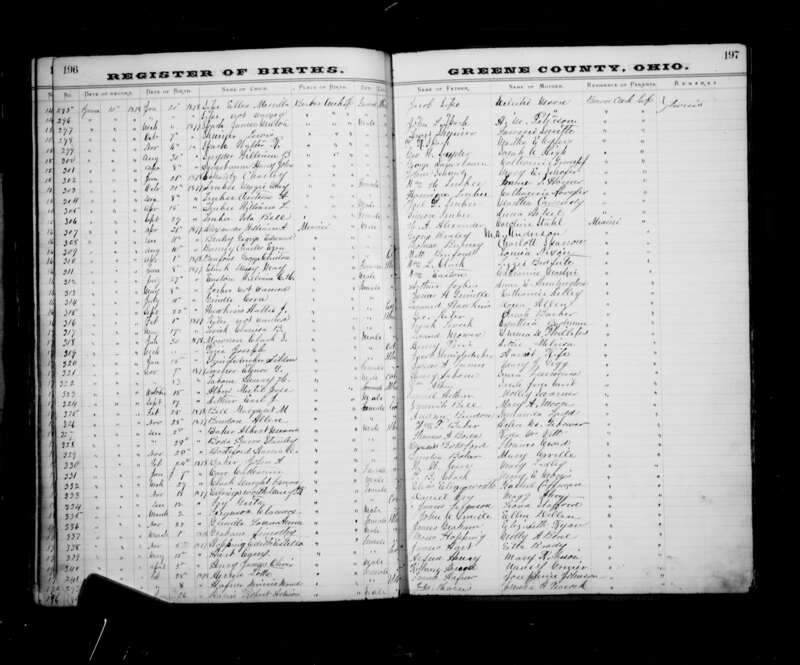 The 1880 U. S. Census taken on June 28, 1880, shows William P. Baker (age 40) born in Ohio to Pennsylvania and Ohio-born parents is a married House Painter, and is living in the Village of Yellow Springs, Miami Twp., Greene Co., OH. Living with him are: his wife, Helen M. Baker (age 34) born in Silesia to Silesia-born parents; his son, Albert M. Baker (age 2), born in Ohio to Ohio and Silesia-born parents; his daughter, Gertrude P. Baker (age 4/12) born in Ohio to Ohio and Silesia-born parents; and his brother-in-law, Charles Gerhardt (age 15) born in Ohio to Silesia-born parents. 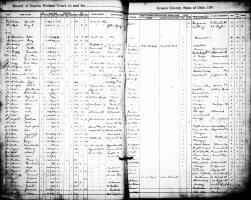 The 1880 U. S. Census taken on June 1, 1880, shows Geo. Baker (age 48) born in Ohio to Pennsylvania and Ohio-born parents is a Farmer living in Miami Twp., Greene Co., OH. Living with him is his wife Lizzie Baker (age 40) born in Ireland to Irish-born parents who is Keeping House. Also there are his four children, all born in Ohio to Ohio and Irish-born parents: Marietta Baker (age 13); Lizzie Baker (age 12); Wm. Baker (twin) age 12); and Geo. W. Baker (age 9). The Isaac Baker family lived next door. 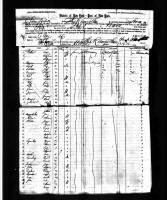 The 1880 U. S. Census taken on June 1, 1880, shows Isaac Baker (age 72) born in Pennsylvania to Pennsylvania-born parents is a Farmer living in Miami Twp., Greene Co., OH. Living with him is his wife Eliza Baker (age 71) born in Ohio to Virginia-born parents who is Keeping House. Also there are: Joseph Baker (age 36) born in Ohio to Pennsylvania and Ohio-born parents, who is a Plasterer. The 1890 Veterans Schedule for William Penn Baker. 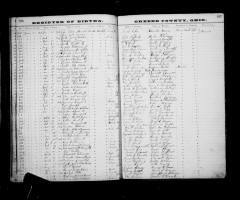 The 1900 U. S. Census taken on June 7, 1900, shows William P. Baker (age 61) born May 1839 in Ohio to Unknown and Ohio-born parents is a House Painter owning his own home on North College Street, Yellow Springs, Miami Twp., Greene Co., OH. Living with him is his wife of 26 years, Helen Baker (age 55) born October 1844 in Prussia to Prussian-born parents and having emigrated in 1857. Also living there are their two unmarried children, born in Ohio to Ohio and Prussian-born parents: Albert M. Baker (age 22) born December 1878 a College Student; and Gertrude P. P. Baker (age 20) born February 1880 a College Student. Also there is William's unmarried brother-in-law, Charles G. Gerhardt (age 36) born January 1864 in Ohio to Prussian-born parents who is a Carpenter. William Penn Baker died July 1, 1907, in the Village of Yellow Springs, Miami Twp., Greene Co., OH, at age 67. Buried in Glen Forest Cemetery, Yellow Springs, Greene Co., OH. William Penn Baker Death Record. WILLIAM P. BAKER PASSES AWAY. Death Summons Life Long Resident of Yellow Springs and Vicinity. William Penn Baker, a lifelong resident of Yellow Springs and the vicinity, died at 10:15 o'clock Monday night of uremic poisoning after an illness of several weeks. Mr. Baker, who was aged 68 years and two months, was born on a farm two miles south of Yellow Springs, and was the son of Isaac and Eliza Baker, pioneer residents of Greene county. He had lived in Yellow Springs since his childhood, and for many years followed the occupation of a painter. He is survived by his widow and two children, Alfred, who is now in South America, and Miss Gertrude, a teacher in the Yellow Springs schools. Three brothers, Clinton, of Dayton; Joseph, of Kansas; and Charles also survive. 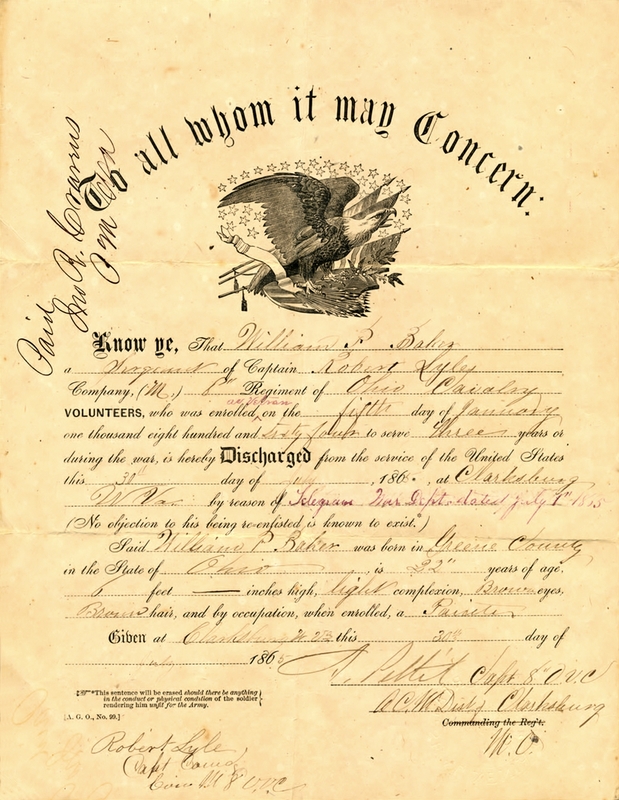 Mr. Baker was a veteran of the Civil War, and was a member of Burkholder G. A. R. Post in Yellow Springs. He was a member of the Presbyterian church in Yellow Springs, and for a number of years a trustee in the church. The funeral services will be held at the home Wednesday afternoon at 2 o'clock, conducted by the Rev. George Black. The burial will be made in Glen Forrest cemetery. He was 68 Years Old and Had Spent His Life in the Village. Xenia, O., July 2, 1907. William Penn Baker, a lifelong resident of Yellow Springs and the vicinity, died at 10:15 o'clock Monday night of uremic poisoning after an illness of several weeks. Mr. Baker, who was aged 68 years and two months, was born on a farm south of Yellow Springs, but had lived in Yellow Springs since his boyhood. He has been occupied as a painter for a number of years. He is survived by his widow and two children, Alfred, who is now in South America, and Miss Gertrude, a teacher in the Yellow Springs schools. Three brothers, Clinton, of Dayton; Joseph, of Kansas; and Charles also survive. Mr. Baker was a veteran of the Civil War, and was a member of the Burkholder G. A. R. Post, in Yellow Springs. He was a member of the Presbyterian Church in Yellow Springs, and for a number of years a trustee in the church. The funeral services will be held at the home Wednesday afternoon at 2 o'clock, in charge of the Rev. George Black. The burial will be made in Glen Forest cemetery. The funeral of William P. Baker was largely attended Wednesday afternoon. Rev. Geo. D. Black officiated at the services. Mr. Baker was an old pioneer painter and paper hangerand for years he did nearly all of that kind of work here. He was a splendid workman and could be trusted implicitly to do the work, and consequently found steady employment. He was a prominent member of the G. A. R., under whose auspices the funeral took place. The interment was in Glen Forest cemetery. William Penn Baker Widow's Pension Card. 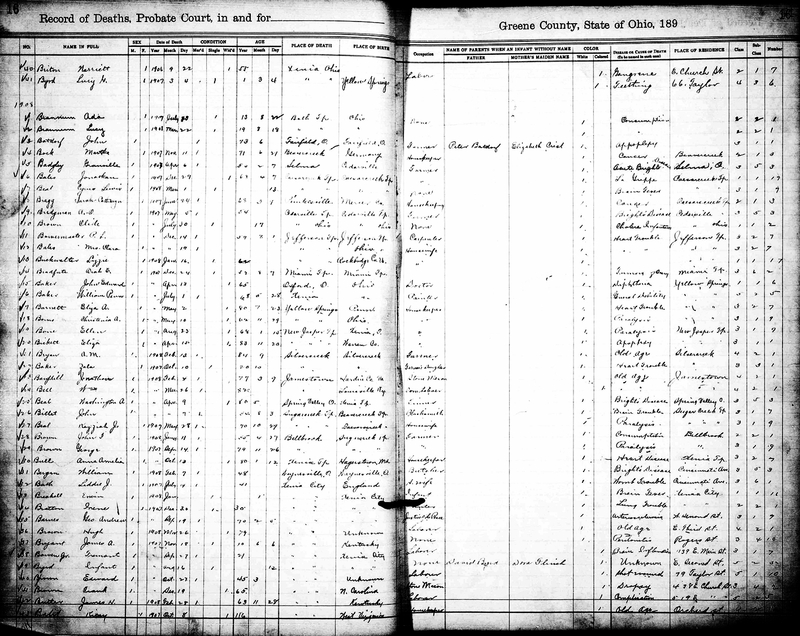 The 1910 U.S. Census taken on April 29, 1910, shows Marie H. Baker (age 64) born in Germany to German-born parents and emigrating in 1865 with 2 of her 4 children still alive is a widowed head of household owning her home on North College Street, Village of Yellow Springs, Miami Twp., Greene Co., OH. Living with her is her unmarried daughter, Gertrude P. Baker (age 30) born in Ohio to Ohio and German-born parents, who is a School Teacher. 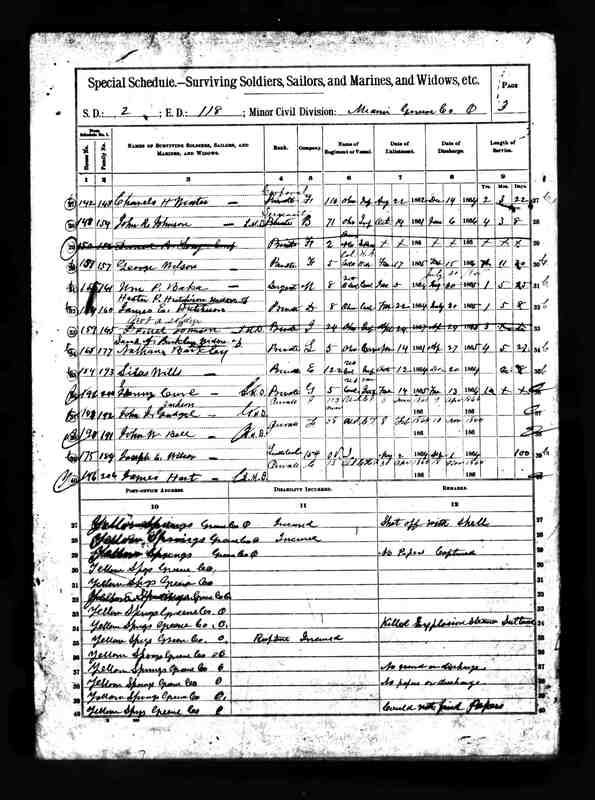 The 1920 U. S. Census taken on January 15, 1920, shows LeRoy M. Bickett (age 36) born in Ohio to Ohio-born parents is a superintendent at a rubber factory who his renting his home at 604 Farwell Street, 18th Ward, City of Milwaukee, Milwaukee Co., WI. Living with him is his wife, Gertrude Bickett (age 39) born in Ohio to Ohio and Prussian-born parents. Also living there are his two daughters, both born in Ohio to Ohio-born parents: Helen Bickett (age 7); and Ruth Bickett (age 3). Also living there is Le Roy's widowed mother-in-law, Helen Baker (age 75) born in Prussia to Prussian-born parents. 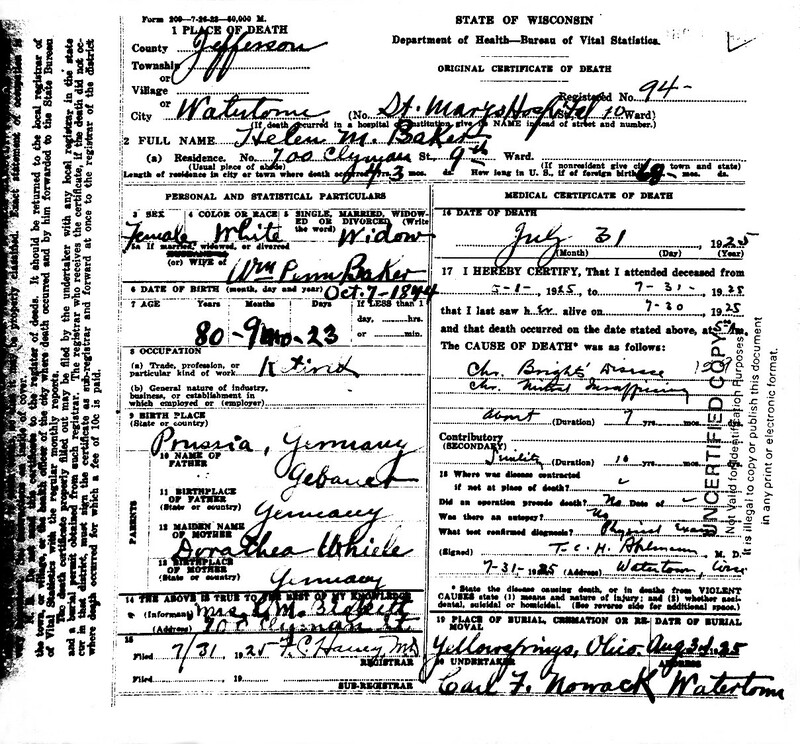 Helen Margaret (Gebauer) Baker died July 31, 1925, in Watertown, Jefferson Co., WI, at age 79. Buried in Glen Forest Cemetery, Yellow Springs, Greene Co., OH. 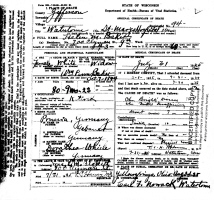 Helen Margaret (Gebauer) Baker Death Certificate. The Watertown Daily Times, Watertown, Jefferson Co., WI, July 31, 1925. Mrs. Helen M. Baker, widow of William Penn Baker and mother of Mrs. L. M. Bickett, 700 Clyman Street, died early this morning at St. Mary's hospital where she had been confined for one week. Mrs. Baker had been in ill health for some time and about six weeks ago she suffered injuries in a fall and this, together with the infirmities of old age, contributed to her death. The decedent's maiden name was Helen M. Gebauer and she was a native of Prussia, Germany, having been born there October 7, 1844. She came to this country with her mother when she was a child of twelve years and they settled near Irontown, Mich. Four years ago she came to Watertown and since then had made her home with her daughter. Her husband preceded her in death eighteen years ago. Besides Mrs. Bickett she is survived by one son, Albert M. Baker, of Wakefield, Mich., and by six grandchildren. The remains will be taken to Yellow Springs, Ohio, for interment, there being no services here. Mrs. Bickett, in her bereavement, has the sincere sympathy of the community and of her friends. Word has been received of the death of Mrs. Helen M. Baker, 81, for many years a resident of Yellow Springs, who passed away at the home of her daughter, Mrs. Leroy Bickett, of Watertown, Wis., Friday. Mrs. Baker lived in Yellow Springs until about five years ago and has since made her home with her daughter in Watertown. Her husband preceded her in death a number of years ago. Mrs. Baker is survived besides her daughter, one son, Albert, of Michigan, and several grand-children. The body will be brought to Yellow Springs for burial Sunday. Funeral services will be held Monday afternoon at 2 o'clock at the Presbyterian Church with interment in Glen Forest Cemetery. The remains of Mrs. Helen Baker, aged 81 years, were brought here Sunday from Watertown, Wis., where she passed away at the home of her daughter, Mrs. Leroy Bickett Friday. The funeral services were held from the Presbyterian Church Monday afternoon with burial in Glen Forest Cemetery. Mrs. Baker is survived by her daughter, Mrs. Bickett and one son Albert of Michigan. YELLOW SPRINGS - Services for William Gerhardt, 60, of Comfort Inn, Xenia Ave., who died Saturday at 1:30 a. m. at Greene Memorial Hospital, Xenia, will be conducted Tuesday at 1 p. m. at Jackson, Lytle and Coffman Funeral Home here. Friends may call at the funeral home tonight from 7 to 9 and burial will be in Glen Forest Cemetery, Yellow Springs. A native of Yellow Springs, he was the son of Charles and Ella Gerhardt. He had been an employe of Antioch College for many years. Survivors include a brother, Floyd Gerhardt of Beechwood, N. Y., and a sister, Mrs. Helen Mason of Everett, Wash. Rev. Charles Rader of St. Paul's Methodist Church in Springfield will be in charge of the services. The late George Baker, a veteran of the Civil War and for years one of the best-known farmers in Miami township, this county, was born in that township and most of his life was spent there, two of his sons and a daughter now occupying the old home place three miles west of Yellow Springs which their father bought in 1881 and on which he spent his last days. He was born on a pioneer farm one mile south of Yellow Springs on November 14, 1831, son of Isaac and Eliza (Graham) Baker, the latter of whom also was born in this county, September 27, 1809, a member of one of the pioneer families of Greene county. Isaac Baker was born in Chester county, Pennsylvania, May 3, 1807, and became one of the early settlers of Greene county, establishing his home here after his marriage to Eliza Graham. He and his wife reared their family here and here spent the remainder of their lives. They were the parents of nine children, of whom the subject of this memorial sketch was the first-born, the others being Mrs. Louise Hawkins, deceased; John, who was killed in the battle of Cedar Creek on October 19, 1864, while serving as a soldier of the Union during the Civil War; William P., who died on July I, 1907; Brinton, who is still living, making his home now at Dayton; Joseph, who is now living at Pratt, Kansas; Mrs. Hester Hutchinson, who is living at Yellow Springs, in this county; Sarah, who died in 1868, and Charles West, who died on April 14, 1914. Five of these brothers served in the Union army during the Civil War. Reared on the home farm in Miami township, George Baker received his schooling in the neighborhood schools at Yellow Springs and early learned the trade of blacksmith at which he worked, at Yellow Springs and at Salem, until he was twenty-five years of age, when, in 1856, he joined that considerable band of Greene county young men, including Senator Plum and Captain Frazer, who went to Kansas in 1856 and started things going in the vicinity of where the flourishing city of Emporia now stands. George Baker set up the first blacksmith shop in Emporia and remained there for three years, or until 1859, being thus an active participant in the desperate struggle that then was being waged in "bleeding Kansas" between the free-soilers who wanted to preserve the Territory of Kansas against the intrusion of the institution of slavery and the "border ruffians" who, coming in from Missouri, across the river and from other points south, were determined to fasten slavery on the prospective state. The struggle finally became so acute that Mr. Baker, in 1859, became disgusted with the unsettled condition of things and came back home and resumed his labors as a blacksmith at Yellow Springs and was living there when the Civil War broke out. Early in the progress of that struggle between the states he enlisted his services in behalf of the Union and went to the front as a member of the One Hundred and Fifty-fourth Regiment, Ohio Volunteer Infantry, with which command he served until the termination of his term of enlistment, when he returned home and started farming ; but a short time later he enlisted in Company K, One Hundred and Eighty-fourth Regiment, Ohio Volunteer Infantry, with which command he served until the close of the war, then returned to his farm and there remained until January 3, 1881, when he bought a farm of one hundred acres three miles west of Yellow Springs, moved onto the same and there spent the rest of his life, his death occurring on February 6, 1890. His widow survived him for more than twenty years, her death occurring on January 18, 1911. George Baker was reared in the Methodist church and his wife was reared in the Catholic church, and their children were reared in the faith of the latter communion. On September 14, 1864, at Springfield, George Baker was united in marriage to Elizabeth Higginson, of Yellow Springs, who was born in Ireland, but whose girlhood was spent at Albany, New York, where she was living when her family came from that place to Greene county during the '50s. To that union five children were born, namely: John Wentworth, who died in 1866; Mamie C, who is still living on the old home place, keeping house for her brothers. William and George, who are farming the place: William J. and Elizabeth (twins), the latter of whom is now a nun, a member of the Visitation Order, in the convent at Georgetown, Kentucky, and the former of whom is noted above as remaining on the home farm, and George, who is also living on the home place, he and his brother operating the same, while their sister Mamie keeps house for them. The Baker brothers are good farmers and have a well-kept and profitable cultivated farm. They are Republicans, as was their soldier father, and take a proper interest in local civic affairs, but have not been seekers after public office. Brinton Baker, dealer in saddles and harness, Xenia, Ohio, was born in Chester County, Pennsylvania, in 1807. Thomas and Sarah, his parents, were both born in Pennsylvania, and immigrated to Ohio in 1812, and have since made this county their home. It is said the first saw mill in the county was built by them. Brinton, the subject of this sketch, was married, in 1831, to Miss Eliza Hivling, of Xenia, Ohio. Six children were born to them, Abraham H., Sarah, John A., Joshua S., Eliza J., and an infant. Abraham, the only one living, is in partnership with his father, was educated in Xenia, and has spent his life here. Mr. Baker was reared by Quaker parents, and is a very moral man. He served as county treasurer from 1852 to 1857, and has been a county infirmary director for fifteen years. He has always been, and is to-day, one of the energetic business men of Xenia. Abraham is now living on the same lot on which he was born. In 1865 he was married to Miss Sallie A. J. Miller, of Frederick City, Maryland, and is the father of three children, Mary E., John A., and Rachel J., all of whom are living with their parents. When the war broke out, he was one of the first to respond, and after its close came home with an honorable discharge, and resumed his labors at his trade. He and his father today are in the foremost rank in their business. Not unlike many other families, we trace the record of the Deans through trials, vicissitudes and poverty back across the sea to the Province of Ulster, Ireland and to the wilds of the Highlands of Scotland, a country rich in the production of liberty loving men and women. Many such dared to leave their native country, crossed the story Atlantic and cast their lot in the wilds of America, infested by hostile enemies and accompanied by privation and discouragements of almost every description. Only the bold spirits, like Daniel Dean, who had the courage to fight for their rights, as a rule survived the ordeal. To such we owe the credit of having made America a safe place in which to live. Amid the pioneer work of conquering and surmounting difficulties of seeming impossibilities, Daniel Dean began his career in this country. The ancestors of the Dean family were strictly of the Coventer faith. Daniel Dean, one with whose history we are familiar and who resided and died not more than a mile from this place, was born in the village of Tubermore in the Province of Ulster, Ireland, October 20, 1766. He immigrated to America in the year 1784 at the age of 18 years. His father, G. R. Dean and his two uncles, James and David, were soldiers in the Revolutionary War. He sent back to Ireland for his mother in the year 1790. He was a weaver by trade, prospering well in his trade. He resided for a time in Pennsylvania, then immigrated to Virginia where he was married to Miss Jannett Steele, a Scotch-Irish girl, of Augusta County, Virginia. The young couple immigrated to Kentucky near Mount Sterling where he was engaged in milling for many years, becoming quite well off in that business. He had a family of eleven children, but falling out with the institution of slavery, he determined to immigrate to Ohio, locating in Greene County in the year 1812 on Caesar's Creek where he purchased 2,000 acres of land -- this farm being a part of the same tract. The names of his eleven children are as follows: Robert Dean, who was a soldier in the war of 1812 and who married Elizabeth Campbell; Mary C. married James Moore; Jannett S. married Hugh Campbell; Elizabeth married James Campbell; Margaret married John Bickett; William married Catherine Shook and was a soldier in the Mexican War; James married Elizabeth Pendray; Joseph married Hannah Boggs; Anna married Walter Parry; Daniel married Jane Campbell; and Julia married James Hopping. All settled down and lived in Greene County, except two -- James and Elizabeth -- who immigrated to Indiana and resided near Muncie, that state. Of these eleven children, they averaged eleven children each. They have since grown into a great multitude. During the Civil War, 36 enlisted in the Union Army, most of them serving three years and over and out of the 36 who enlisted, 35 returned alive. Dean Perry lost a leg at the battle of Perrysville, Ky. Three of the others were slightly wounded, and James Moore died with disease at Wartrall, Tennessee and of the 36, ten are yet alive. Of this large family of near 500, more than three-fourths are members of the Christian Church, and 90 percent are total abstainers from the use of intoxicating drink. This reunion is the centennial anniversary of the immigration of the ancestor Daniel Dean and his family from Kentucky to Ohio. They landed in this county in September, 1812, and camped on the banks of a small stream near the site which afterward became the Dean Cemetery. Eating their first breakfast on a large flat rock, about 20 feet in circumference and perhaps two feet in thickness, which served very well for a table. This rock still remains as a relic and a monument to the memory of our ancestors. The early history of the immigration of Daniel Dean to Ohio is so intimately associated with his brother-in-law Henry Barnes, who also immigrated from Kentucky near the same time, that we thought it would be well to give a part of his history which is so closely connected with Daniel as to make this sketch more interesting when taken together. Daniel Dean first came to Ohio in 1808 with Henry Barnes, as did Joshua and Caleb, spying out the land. It was upon this visit that Daniel purchased this 2,000 acres of land, but soon became involved in a suit over the title which cost him $1,500 to perfect his title, which he did not succeed in doing for about three years thereafter, which delayed his removal to this County. Henry Barnes, being an excellent mechanic, and so became a useful associate and friend of Daniel and their mutual friendship was never betrayed by either, but continued a strong support to each other during life. Barnes came to this County in 1808 with Daniel and located in Xenia, which then had only a few houses. He owned about one-fourth of the present site of the City. He built many houses in Xenia assisted by Daniel Dean, Dean furnishing the timber while Barnes did the work. Parts of some of the buildings yet remain that they built. Barnes was a strong man in other respects - he was a man of some education - was a surveyor. He was a man of General Jackson's type. He was a member of a company of Indian Hunters in Kentucky, and had been engaged in many Indian hunts in Kentucky. On his immigrating to Ohio his military character was soon recognized, and he was placed as Captain over a company of militia at his new home, and this State being full of treacherous Indians one can well see that such a man as Captain Barnes would be considered a very valuable citizen. Barnes continued to reside in Xenia until his death. He was a member of the M. E. Church, and a Christian man. He had seven children. Henry, who was during the Civil War Sheriff of Greene County and also the Treasurer of Greene County two terms; Dean, John, Andrew, Mrs. Hannah Buckles and Mrs. Eliza J. Clemans and Mrs. Elizabeth Davis, all of which families married and had large families -- valuable members of society. To show the determination of the mother, wife of Captain Barnes, there was an emergency which required her presence back in Kentucky. She mounted her horse with her little child less than a year old, and rode back to Kentucky alone, a distance of 150 miles, back to her old home. When Daniel Dean came to Ohio he brought with him four wagons - two four-horse teams and two two-horse teams. One of these teams belonged to Captain Barnes. On their way to Cincinnati a stray dog came to them, and as they had no dog he was encouraged to remain, which turned out to be a very valuable asset to the family. Many interesting stories were told of the value of this dog and one of Daniel's horses whose name was Jolly. They gave the name of Range to the dog. A story was told of the dog that after they had passed through Cincinnati, which was a very small village, and took the trail or road toward Greene County, and after they had gone about 15 miles, night came on and they were compelled to camp in the wood. Much fear was entertained of the Indians. At about midnight Range began to raise the alarm of the approach of an enemy. There were four men who had guns. All arose and remained up until daylight. It was supposed that the dog had in fact discovered Indians approaching attempting to steal their horses. After the arrival of the family, and for two or three days thereafter, Range was heard baying something a few hundred yards from camp not far from what is now the family cemetery. James and William took their rifles and went to see what Range had found. On reaching the point, they saw Range baying a bear. It was up on its hind feet challenging Range to a fisticuff which Range declined to accept and while in this posture, William shot him and this bear meat was relished by the family much to the credit of Range. Another story is told of Captain Barnes and Daniel. A month or so after reaching Ohio they started out to find some friends who settled near the present site of Clifton, both riding horseback; Daniel riding Jolly a noble horse, and the dog Range following after them. On finding this settlement they were cordially received, and their company being genial and entertaining they were induced to remain with them a little too long. On starting home they had not gone far when a cloud came up and they were enveloped in darkness, and soon became bewildered and lost. Not knowing what direction to take, they finally decided to let Jolly have the reins, trusting to his instinct to take them to the camp, Range still following behind. As soon as Jolly was given the reins, he turned about and Captain Barnes objected saying he knew Jolly was going in the wrong direction. But Daniel insisted that Jolly's judgment had been good on other occasions and he could trust him. Jolly set out in a fast walk. It began to storm and thunder furiously. After they had gone quite a distance at about midnight they missed Range, and after a while they heard him barking. He did not like a storm, and during such times he would come to the door of the camp and bark until he was admitted. As soon as Jolly heard the dog bark he started out in a lope and soon reached camp. Grandma, fearing that they were lost, would not let Range in so that he would continue to bark and thereby assist the lost men to find the camp. Jolly went direct to camp and did not betray the trust placed in him. Daniel Dean was a member of the Associate Presbyterian Church from early life. His wife Mrs. Jannett Dean was a member of the first Missionary Society organized in Greene County. Daniel Dean was an ardent abolitionist; he hated the institution of slavery and enjoyed the distinction of being the first member of that church who was ever arraigned before the session of the church for denouncing his minister for praying for the institution of slavery in which he gained a signal victory, and that same church still exists and prospers and is to be congratulated on being the first church in Greene County to hold a temperance meeting, all members attending, which resulted in a resolution that all members of that church thereafter refrain from the use of intoxicating liquor except in sheep washing and harvest time. This is amusing now, but the great benefit to the temperance cause as a result of that meeting cannot be estimated. Daniel Dean died in 1842 at the age of 77 years. He was a man of worth, a respected citizen of his community and an upright Christian gentleman. His remains rest in the Dean Cemetery, by the side of his wife Jannett. A suitable monument marks the spot. He was a very liberal man in his dealings with his neighbors, exacting but what was right and just. 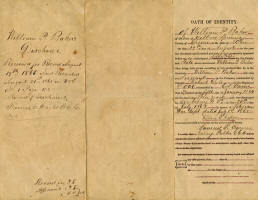 In his will, which is on record in the Probate Court of this county, he requested that no suit should ever be brought against any person indebted to his estate, and this was fully carried out by his executors, John Bickett and Walter Parry, his two sons-in-law. I hope you will not consider it an imposition if I make an inquiry regarding a very early resident of Winchester, Ky. My son-in-law, William Christian Moore, is descended from James Moore (1788-1845) who married Mary Campbell Dean (1795-1857), the daughter of Daniel Dean (1765-1843) and Jeannet Steele (1768-1841). The latter came from Augusta County, Va. James Moore was married in 1811 and came from Winchester or its vicinity to Greene County, Ohio in 1812. James Moore had the following sons Samuel, James G., Daniel M., William Henry, and Thomas. William Henry (1820-1890), the grand-father of my son-in-law, married Harriet Wilkerson b. 1827. James G. married Mary Sipe in 1834 and moved to Indiana. Samuel married Rachel Ewing and went to Indiana. I am, however, interested in the ancestry of James Moore (1788-1845) who came to Ohio from Ky. There are several Moore families in that part of Kentucky and although I have examined many records I have been unable to ascertain to which the said James Moore belongs. It is possible that in your chapter records you may have the information which I desire. It may be that you can refer me to some other resident of Winchester who will have this information. In either case I shall be under deep obligation to you for any effort you may make in my behalf. I am extremely anxious to secure this information in order that my son-in-law may become a member of S.A.R. 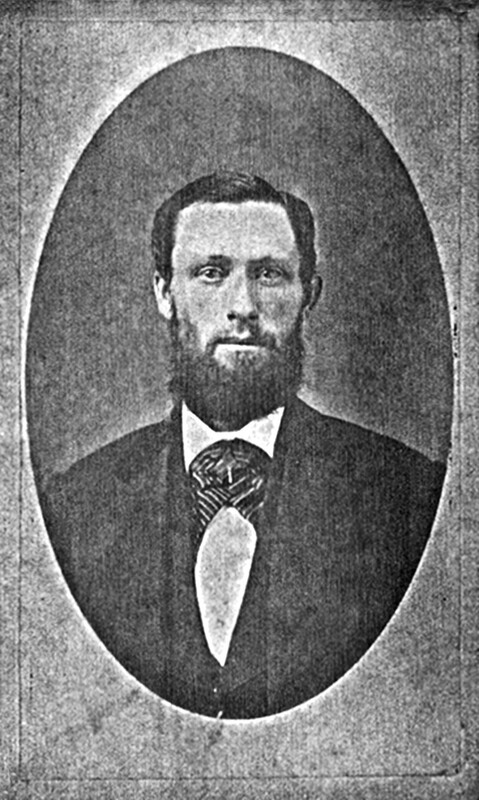 J. D. Hawkins, merchant, Yellow Springs, was born in Maryland, April 25, 1832, and is a son of Abram and Anna (Kuhn) Hawkins, both natives of Maryland. They had a family of eight children, five of whom are living. The subject of this sketch came to Ohio in 1852, walking nearly all the way from Cumberland, Maryland, and after landing in Ohio, commenced working for Hon. 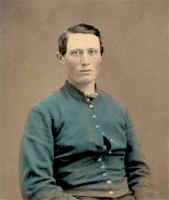 Aaron Harlan, and cut and put up about three hundred cords of wood, the first winter in Ohio; he then worked in the warehouse of Stewart Brothers for one year, and on December 8, 1853, was married to Miss Louisa Baker, daughter of Isaac Baker, and niece of Brinton Baker, of Xenia, who bore him four children, all dying in 1863, within one week; their names were, Albert M., Anna E., Eddie W., and Harry. He enlisted in Company D, Captain Tully's Forty-Fourth Ohio Volunteer Infantry, Colonel U. S. Gilbert, for three years, and was honorably discharged. Is a member of the Masonic order, and also of the Independent Order Odd Fellows. Voted the Democratic ticket in 1853-4-5; after that, when the Republican party was born, he has voted that ticket solid. Through his unswerving energy, faithfulness to business, and honest, square dealing, he has gained a reputation worthy the confidence and support of all good, honest people. He is now engaged in the dry goods business at Yellow Springs, and is doing his full share of the business of the place. Has filled the office of corporation treasurer for twelve years, and that of township treasurer for three years, and, in the writer's judgment, is today well qualified and worthy to fill any office in the county within the gift of the people.